Shine On You Crazy Pyramid - In this episode we'll learn some cool facts about the pyramids, such as how they would have appeared 4,500 years ago. The Great Sphinx of Giza (near Cairo, Egypt) was carved from limestone bedrock, most likely 4,500 years ago, thus making it a contemporary of the Great Pyramids near which it stands. 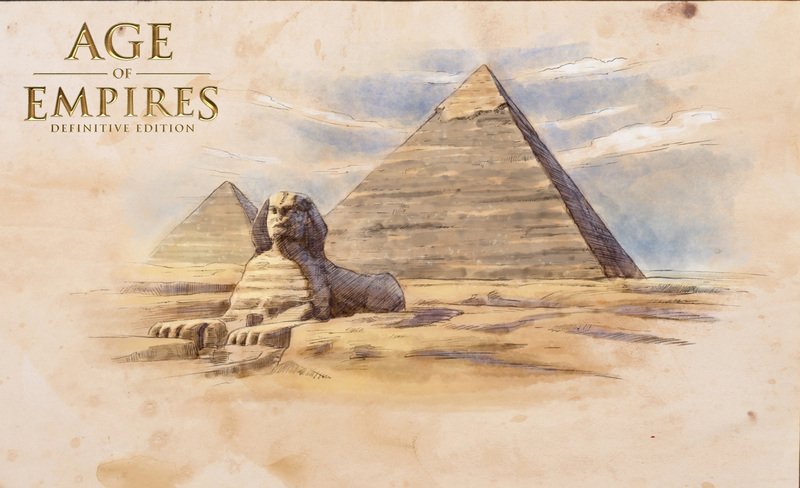 In ancient Egypt, the monument was not called the Sphinx, but was known by a completely different name. It was ancient Greek travelers to Egypt who gave the statue its current appellation. They thought it resembled The Sphinx from their legends—a human-lion hybrid who choked its prey (the Greek word from which the word sphinx is derived literally means "to strangle”). The Egyptians of the Old Kingdom who built the Sphinx (possibly the Pharaoh Khafre) left no record of it on any hieroglyphs; but the people of the New Kingdom called it Horus of the Sky (Hor-em-akhet). The Sphinx and the temple that used to stand in front of it might have been a complex used to worship the sun which sets directly behind it at the Equinox. Regardless of its name, the majesty of this monolithic sculpture has fascinated people for thousands of years and, hopefully, will continue to reveal its mysteries. 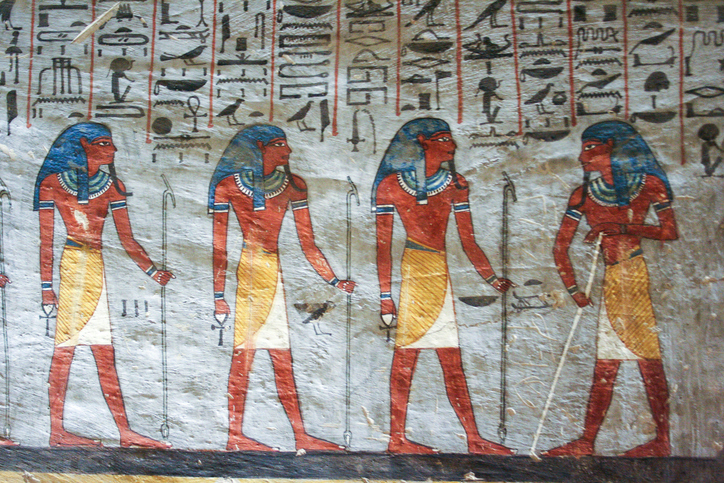 The Egyptian culture was one of the oldest and most long-lived of antiquity. It benefited from an abundance of rich farmland, nearby mineral resources, and a good strategic position. Despite occasional invasion and internal strife, it endured as a distinctive culture for nearly 5000 years. Ancient Egypt occupied almost the same area as modern Egypt does today. Its civilization stayed very close to the Nile River. Because it was nearly surrounded by desert, enemies could approach only from the west and northeast along the Mediterranean coast, from the south down the river valley, or directly over the sea. During its long history, the capital of Egypt was located at various times in Hierakonpolis, Memphis, Herakleopolis, Thebes, It-towy, Akhenaten, Tanis, Sais, and Alexandria. The most important of these were Memphis and Thebes. Alexander the Great founded Alexandria as the capital in 331 BCE. The Macedonian Ptolemaic dynasty ruled Egypt from Alexandria until 30 BCE. Immigrants brought agriculture to the Nile Valley prior to 5000 BCE from the highlands of Canaan. By 3100 BCE, agriculture had spread southward up the Nile. Flooding was under control and irrigation put much more land under cultivation. The abundance of food led to large populations and increased wealth for the area. The early history of Egypt was a period of consolidation. Two separate kingdoms rose and vied for power along the river. Around 3100 BCE, King Menes of Upper Egypt conquered Lower Egypt (centered on the lowland river delta) and established the First Dynasty. Between 3100 BCE and 1300 BCE, the Egyptians struggled with Nubians and Kushites up the Nile to the south. Forts and garrisons held the frontier, but during periods of weakness these were destroyed. Around 1300 BCE the Nubians suffered an important defeat and were neutralized as a threat for about 500 years. Egypt’s Dynasty XIII, 1783 to 1640 BCE, was very weak. During this period, the frontier forts to the south were lost and Semitic immigrants from the east moved into the delta. These immigrants, called the Hyksos, took control of the entire delta region in 1674 BCE. The Hyksos eventually adopted Egyptian culture and language; and introduced the horse and chariot. Dynasty XVIII founded the New Kingdom in 1552 BCE, following a successful war to drive out the Hyksos. 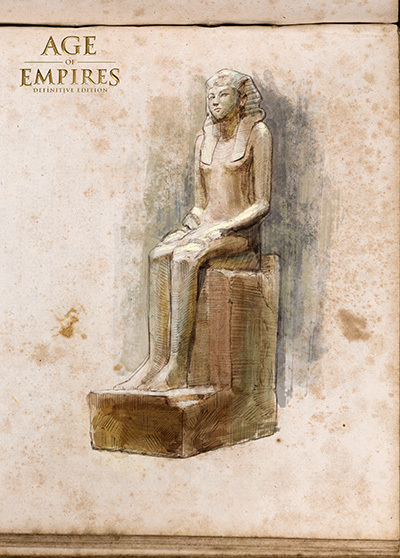 This dynasty was the great age of the warrior pharaohs and the Egyptian Empire. 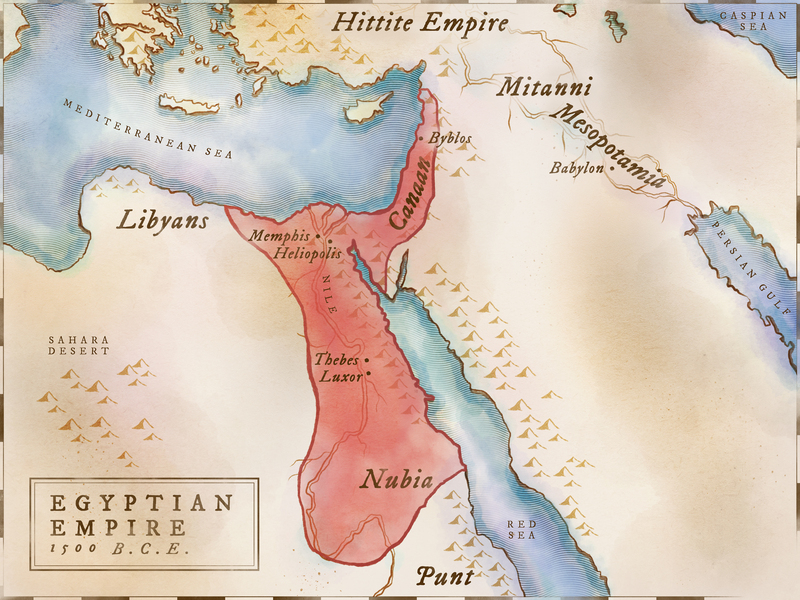 To prevent further incursions from the east, the Egyptians attempted to establish control over the kingdoms in the Levant and Canaan. Now they vied for control with the Hittites and Mitanni, as well as the local kings. The Egyptians were the dominant power in the Near East until around 1200 BCE when invaders overran the entire area. Egypt was an agricultural society dependent on the water and soil brought down each year by the Nile from the highlands of Ethiopia. Extensive irrigation made it possible to farm fields not adjacent to the river but still close enough to be inundated each year and to receive new sediments. The principal crops were wheat and barley, which were used to make bread and beer, the staples of their diet. They also grew fruits and vegetables and raised cattle, pigs, sheep, goats, geese, ducks, and pigeons. The abundance of food nourished a large population and allowed the export of surplus grain. The Nile passes through several hilly regions, and some of these were rich in minerals. The nearby Sinai Peninsula also held mineral wealth. Unlike some other ancient cultures, the Egyptians had relatively easy access to copper and gold, further increasing their prosperity. The hills were sources of granite, limestone, and sandstone that they used for construction. The Egyptians were one of the first cultures to build boats and they eventually took these into the Mediterranean. Egypt became an important Mediterranean port of call as trade increased because it was a rich market for both buying and selling. The Egyptian religion had over 2000 gods, though only a few of these were predominant. The important gods had a cult center where their principal temple was located. One of the most important was Ra, the sun god, understandably critical to an agricultural society. They believed in a life after death. They referred to this as the “next world,” and thought it was somewhere to the West. They developed elaborate burials and embalming to preserve the body for this second life. Goods and servants were buried with royalty and nobles to serve them. Hatshepsut was the most accomplished female pharaoh in the history of ancient Egypt and reigned for two decades (15th century BCE). She is shown barefoot and wearing only the nemes (striped headcloth) and shendyt (kilt)—a symbolic dress that might have evolved from an early version of a hunting skirt. 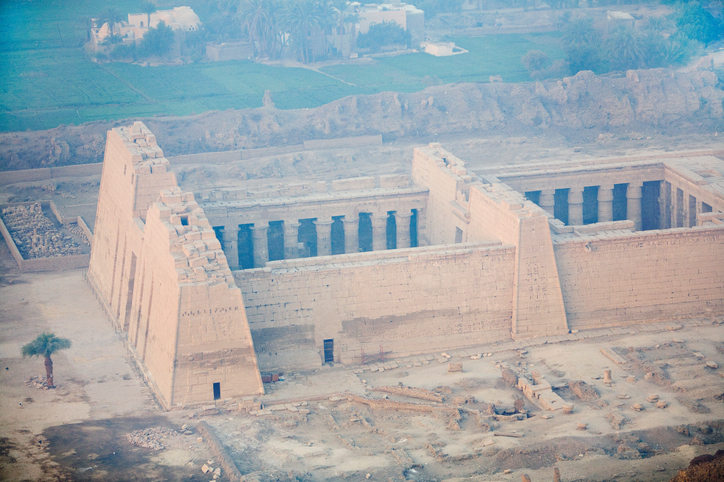 The Pharaoh is famous for sending trading expeditions to the Land of Punt, and the building of her vast Mortuary Temple—Djesser-Djeseru (“Holy of Holies”)—at the Theban Necropolis. 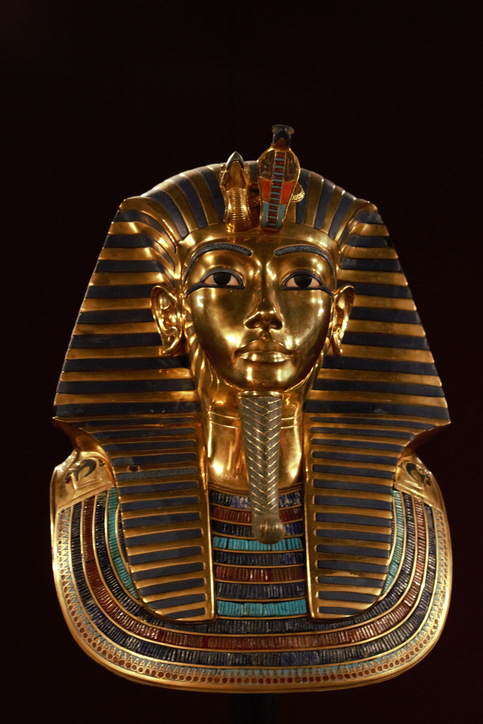 In 1903 CE, British archaeologist Howard Carter (discoverer of King Tut’s tomb) unearthed one of her empty sarcophagi. Her mummy wasn’t identified until over hundred years later; and is now displayed in the Egyptian Museum in Cairo. Egyptian archaeologists identified the corpse by fitting a molar they knew belonged to the woman pharaoh into the skull of the mummy in question; and by conducting DNA tests linking her remains to other previously identified family members. The ancient Egyptians believed that their kings were descended from the sun god Ra. They believed that they could communicate with the gods through their king, known as a pharaoh. The pharaoh had absolute power but was required to perform several important duties. They were responsible for the harvest and irrigation of crops. They directed the government, trade, and foreign policy. They enforced the laws and led the army. 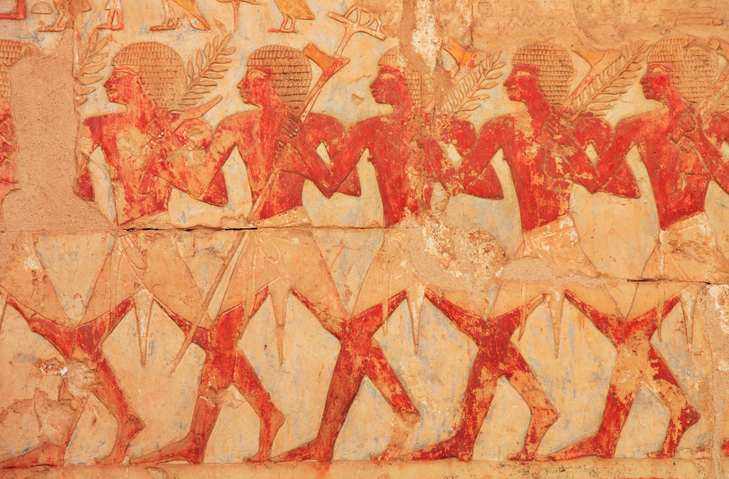 During the New Kingdom, the pharaohs usually commanded their armies in the field. Reporting directly to the pharaoh were two viziers, one for Lower Egypt based in Memphis and one for Upper Egypt based in Thebes. Below the viziers were rural districts controlled by governors and towns run by mayors. These officials carried out the pharaoh’s orders and collected taxes. Scribes kept the records. The Egyptians had no coinage until Alexander the Great conquered them. All workers paid taxes by turning over a percentage of their production, whether it was fish, grain, trade goods, pottery, or other goods. In addition, each household had to provide a laborer for several weeks each year for mining or public works. Laborers fulfilling their annual service dues probably helped build the pyramids. The three biggest pyramids (Khufu, Khafre and Menkaure, c. 26th century BCE) making up the Giza pyramid complex are one of the most iconic sights on the planet. Constructed from millions of perfectly cut limestone blocks stacked on bedrock, the sacred pyramid shapes were made to house the remains of pharaohs. The word pyramid comes from ancient Greek pyramis. 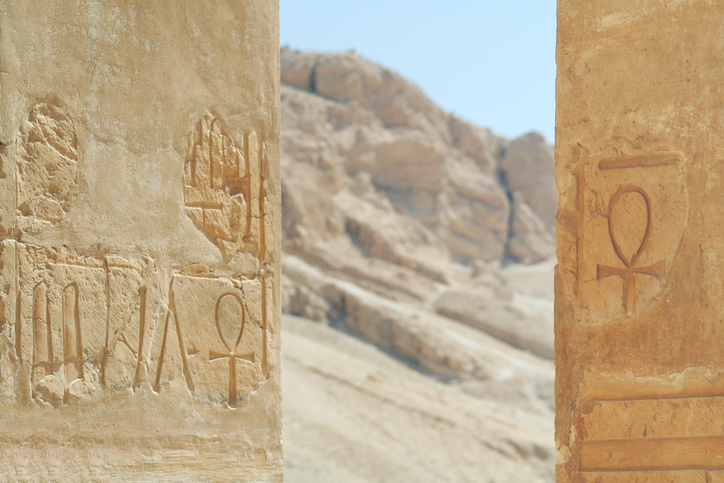 The ancient Egyptian hieroglyph for the structure is mr (pronounced “mer”). The smaller pyramids in the complex housed the remains of queens. 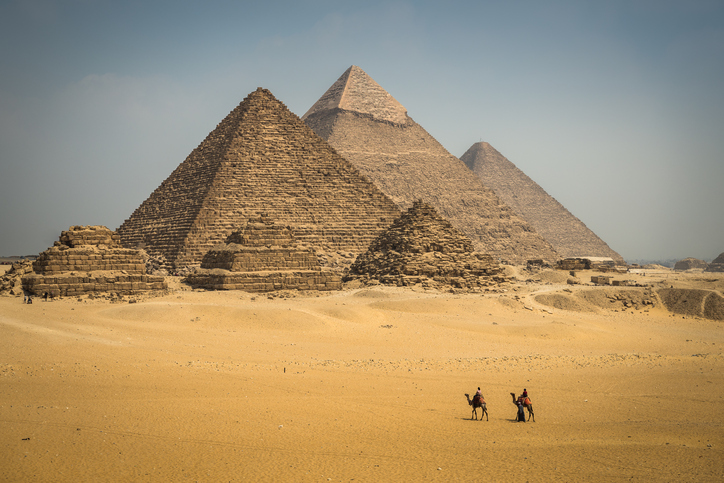 The earliest Egyptian structures were created from simple mud bricks—Nile clay and sand mixed with other ingredients like straw and dried in the Egyptian sun. In fact, the first tombs built during the Old Kingdom were made from these modest bricks. They are called mastaba (“stone bench”) in Arabic because of their flat tops and sloping sides. 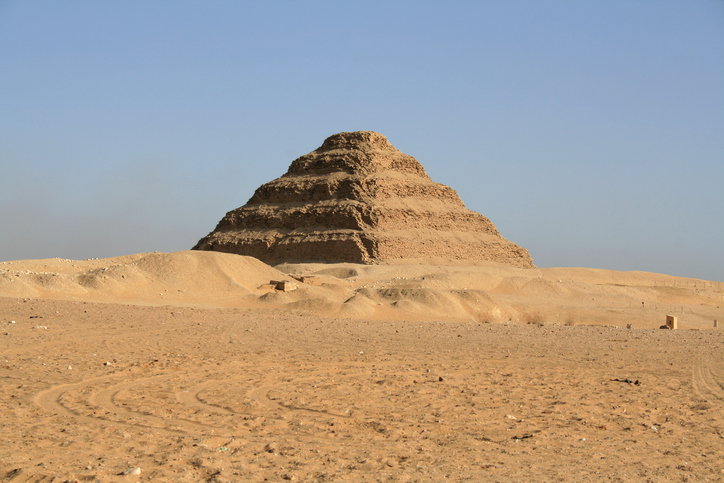 The first pyramid (c. 2667-2648 BCE) was the Pyramid of Djoser, made of six brick mastabas stacked on top of each other. 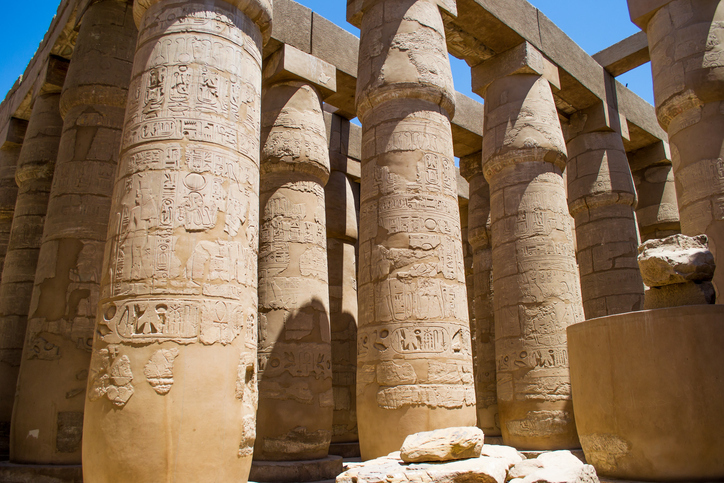 The Egyptians used a post and lintel system to create elaborate buildings, like the Temple of Karnak with its stout pillars supporting massive stone slabs. The Egyptians were among the first cultures to possess the necessary population and wealth to build standing armies of professional soldiers. Prior to the Hyksos invasion around 1675 BCE, Egyptian soldiers were equipped with simple bows, maces, and spears. 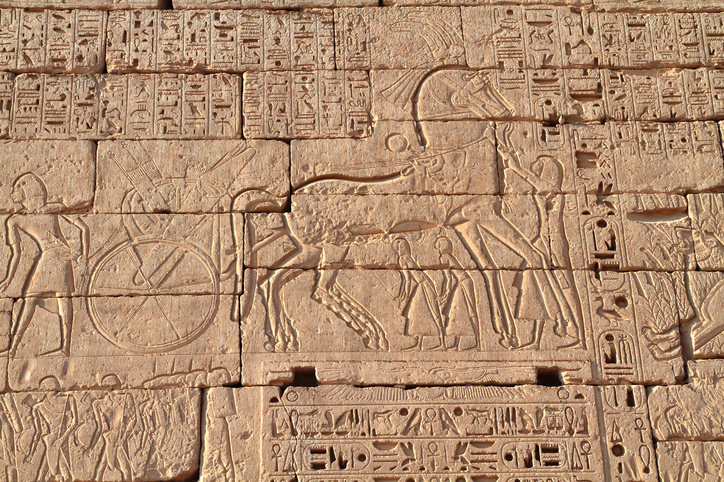 The Hyksos introduced the horse and chariot, which were quickly adopted by the Egyptians in turn. The dominance of the Near East by New Kingdom Egypt, from 1600 to 1200 BCE, was primarily due to the large and powerful chariot armies sent into battle there. 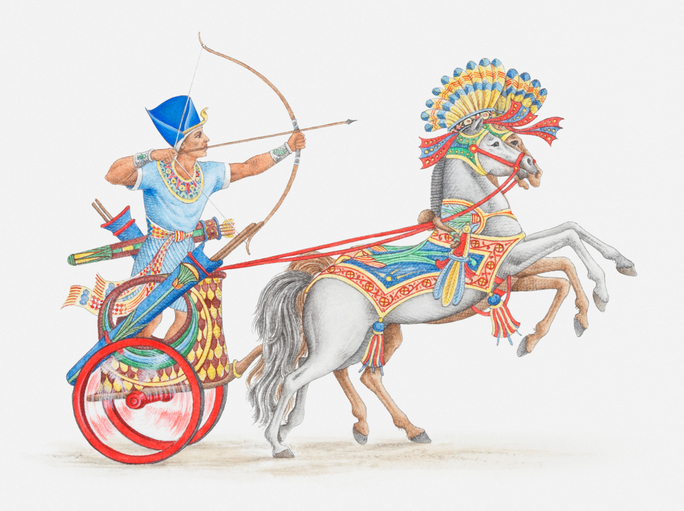 These chariots carried a driver and composite bow archer and were the elite force of the army. Egypt survived the catastrophe of 1200 BCE by fighting off several major attempted invasions. They went into decline, nevertheless, following the death of Ramesses III, who was the last of the great warrior pharaohs. Their decline was partially due to trade coming to a virtual halt for several generations. 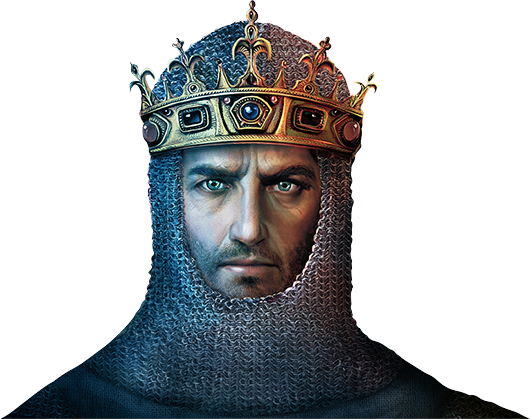 A series of weak kings and civil wars over succession to the throne also eroded their strength. In 728 BCE, the Nubians conquered Egypt, holding it for 60 years. In 665 BCE, the Assyrians completed a conquest of Egypt by sacking Thebes. A new native Egyptian dynasty arose in 664 BCE, eventually throwing out the Nubians and asserting their independence from Assyria by withholding payments of tribute. In 525 BCE, Egypt was conquered again, this time by Cambyses II of Persia. When the Persians faltered in their war with the Greeks, the Egyptians reclaimed their independence briefly before succumbing once more to Persian invasion in 332 BCE. Within a year, however, the Persians themselves were gone, destroyed by Alexander the Great who was accepted by the Egyptians as their pharaoh. Macedonians ruled Egypt as overlords from the time of Alexander the Great until 30 BCE, when Cleopatra VII, the last of the Ptolemaic dynasty, and Mark Antony were defeated by the Roman Octavian (the future Augustus Caesar). Egypt thereafter became part of the Roman Empire. 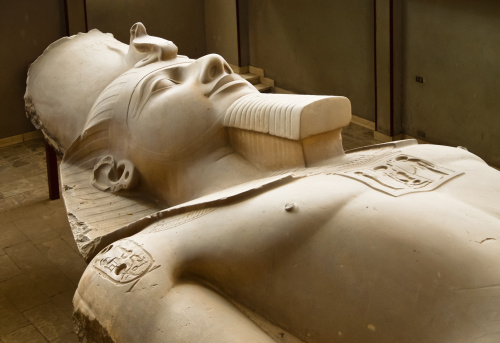 The ancient Egyptians are remembered for the quality and quantity of cultural objects that have survived to the present, including the Pyramids, the Sphinx, the treasures of Tutankhamen’s tomb, the other monuments and temples of the Nile Valley, hieroglyphics, mummies, and papyrus. They are also remembered in the West because of their prominent role in the history of ancient Israel, as recounted in the Old Testament.